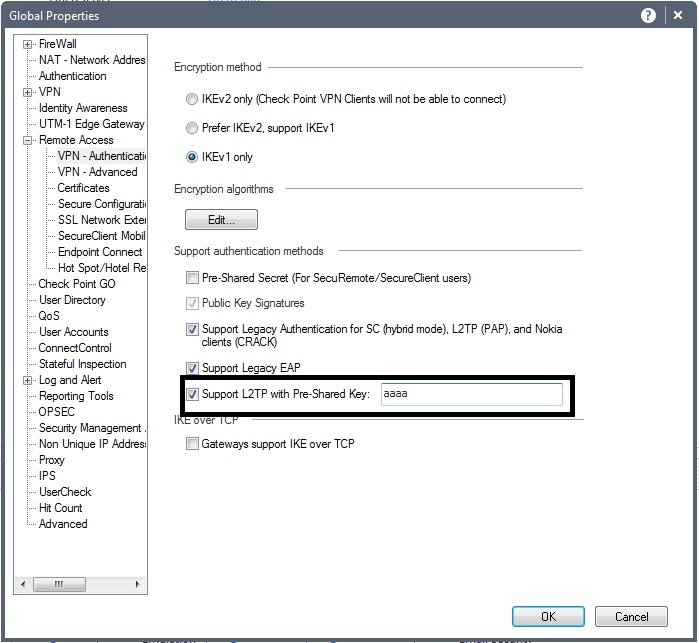 In 'Gateway > Global Properties > Remote Access > VPN - Authentication', select "Support L2TP with Pre-Shared Key". 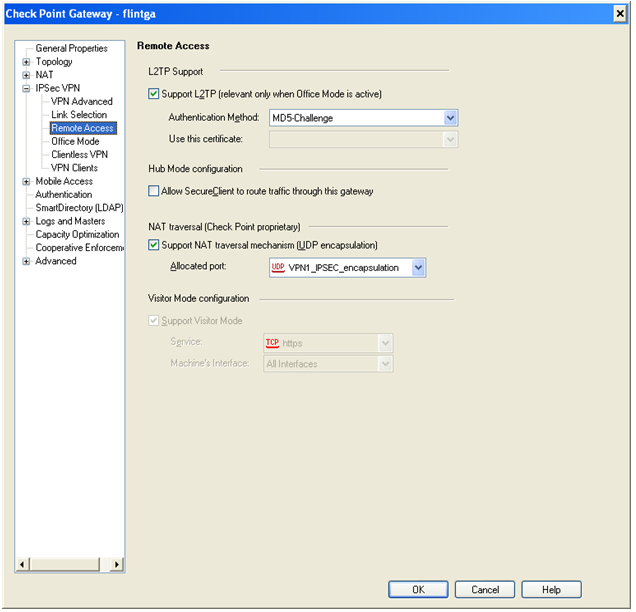 L2TP requires Office Mode definition for the Security Gateway: 'Gateway Properties > Remote Access > Office Mode'. Allow Office Mode to all users (or to a specific group). 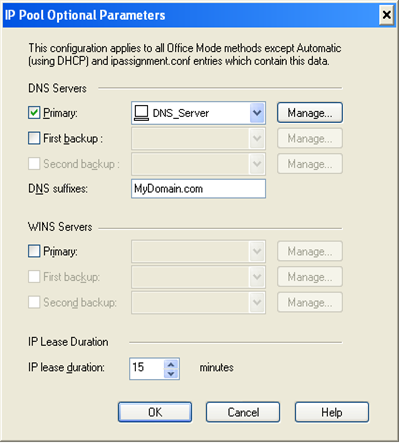 * For more Office Mode configurations methods and options go to the VPN Gateway Admin guide. Note: For Security Gateway versions before R71 there was no GUI for configuring the Pre-Shared key. It was configured in a file calls l2tp.conf on the Security Gateway under $FWDIR/conf. From your iPhone home screen, go to 'Settings > General > Network > VPN > Add Configuration'. Go to Settings and set the VPN switch to "ON". The Password screen appears. Enter your password or (if used) your RSA SecurID one-time-password. Give a VPN Name to your connection (i.e. MyVpn). In "Set VPN server", provide your VPN-1 server FQDN (DNS name) or IP address. 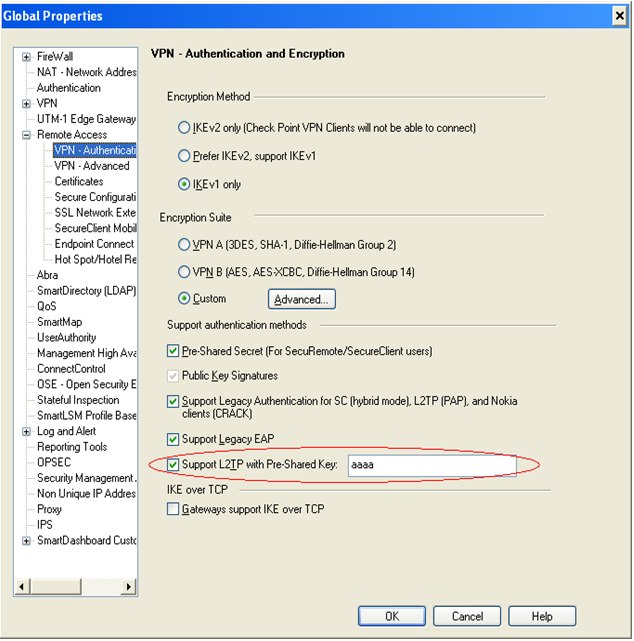 In "Set IPSec preshared key", set the global pre shared secret key. You might be asked to enter the storage credentials. In case it is the first time that you are using the storage, you will have to define a new password for it. Tap on menu to save changes. The VPN Connection will be added to your VPN Settings configuration. Go to device's 'Settings > Wireless & Networks > VPN Settings' and select your VPN connection. The user name and Password screen appears. Enter your credentials for authentication. 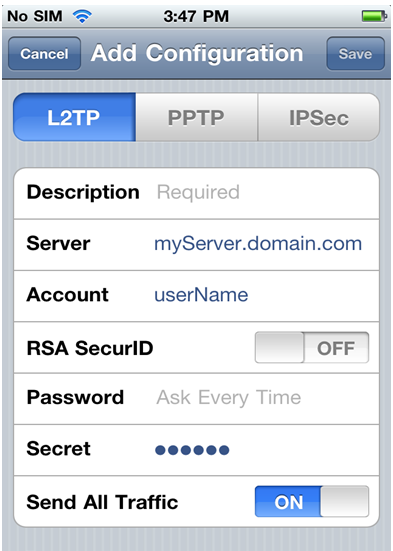 Important: We don't recommend using the L2TP option in Android due to security vulnerability issues. sk42491 and sk44967 have been merged into sk63324.